Martha Pinkerton and her brother Frank (1858-1931, solicitor) were long-standing supporters of the Ballarat School of Mines (SMB) and its students. 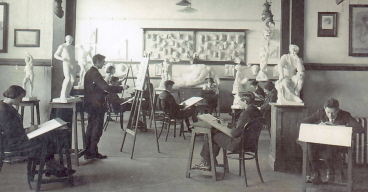 Following their deaths in the 1930s, the School became the recipient of two important bequests that were to lead to the establishment in perpetuity of the following student scholarships: firstly, the Frank Pinkerton scholarship valued at £30 per annum for three years and free tuition in architecture, metallurgy, applied chemistry, mining, electrical, mechanical or civil engineering-and secondly, the Martha K. Pinkerton art scholarship of the same value, 'for talented and deserving students from the City and District of Ballarat.'. These siblings were two of the three children fathered by William Pinkerton, one of the 'Golden City's' successful, pioneer mining investors. In the early 1930's Martha, who was a past student at the SMB Art and Technical School, began to give a succession of practical donations to the institution which commenced during the Depression years. Thereafter, for approximately a decade until her early death, she continued to donate £50 annually to assist with the payment of the fees of students at the Technical Art School who were experiencing financial difficulties. Martha Pinkerton died at Ballarat on 5 April 1939, leaving real estate valued at £750 and personal estate assessed at £7,807. After payment of debts the sum of approximately £7,000 was distributed equally between the Art School at SMB, the Ballarat Fine Art Gallery, Ballarat College, St Andrew's Kirk Presbyterian Church, her brother William Pinkerton, and two others being one female cousin and a niece. In the School's 1939 Annual Report its President, W.H. Middleton, announced 'I am very pleased to be able to report that in December we received £500, being the first instalment of the one-seventh share bequeathed to us by the last Miss Martha K. Pinkerton. This money is to be invested and the interest used to provide scholarships for students in the Art School. It will be remembered that the late Miss Pinkerton was a past student of the Art School and for a number of years provided annual scholarships of £50.' SMB received a further instalment of £365 from Martha's estate in 1940, and when the final payment was received in 1941 this important bequest reached a total of £951.